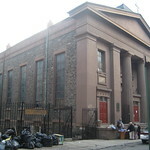 A prominent Irish Catholic church in the Lower East Side, St. James had a huge following. 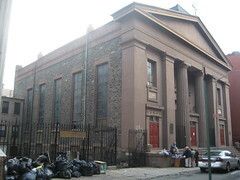 It was also the birthplace of the Ancient Order of the Hibernians, a society that promoted the fraternal association of religion and self-defense. Founded in 1836, it helped to unite members and encouraged them to socialize in an unfamiliar environment. Another society that formed in conjunction with St. James’ church was the Father Mathew Total Abstinence Society. Unlike a highly suspect, secret Irish nationalist society, temperance society’s, such as the Total Abstinence Society, was respectable and encouraged the involvement of women. The historic research contained in this Open Green Map is from the book: "Six Heritage Tours of the Lower East Side" by Ruth Limmer, in collaboration with NYC's Lower East Side Tenement Museum.